The Liu Institute presents a talk by Prof. CHEUNG Sui-Wai (CUHK). A reception will follow the talk. The talk is free and open to the public. 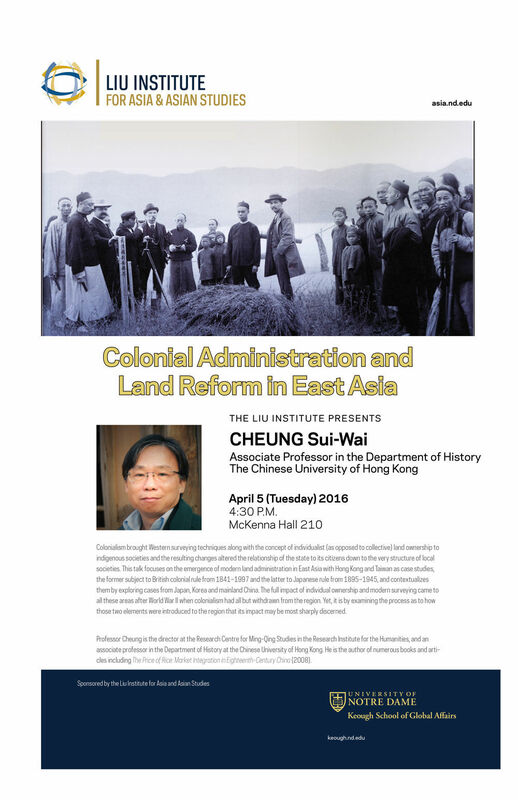 Prof. Cheung will discuss his work on East Asian land reform and colonial administration. Colonialism brought Western surveying techniques along with the concept of individualist (as opposed to collective) land ownership to indigenous societies and the resulting changes altered the relationship of the state to its citizens down to the very structure of local societies. This talk focuses on the emergence of modern land administration in East Asia with Hong Kong and Taiwan as case studies, the former subject to British colonial rule from 1841–1997 and the latter to Japanese rule from 1895–1945, and contextualizes them by exploring cases from Japan, Korea and mainland China. The full impact of individual ownership and modern surveying came to all these areas after World War II when colonialism had all but withdrawn from the region. Yet, it is by examining the process as to how those two elements were introduced to the region that its impact may be most sharply discerned. Professor Cheung is the director at the Research Centre for Ming-Qing Studies in the Research Institute for the Humanities, and an associate professor in the Department of History at the Chinese University of Hong Kong. He is the author of numerous books and arti- cles including The Price of Rice: Market Integration in Eighteenth-Century China (2008).